It was something most of her fans thought would never happen. 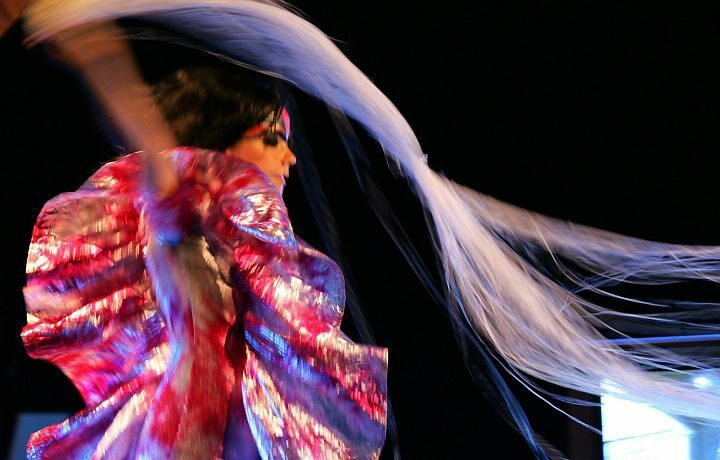 We all thought there was more likelihood of the winter Olympics being held in Lucifer’s hometown, than of an artist like Björk coming to Jakarta. It must be cold down there in Hell right now because, thankfully, we have been proven wrong. She came, and she dazzled — beyond any expectations. Dressed in a lavish metallic dress that made her appear like an ethereal faerie-like creature from the future, she burst onto the stage at Tennis Indoor Senayan, on the night of Feb. 12, with energy equal to that of a star going nova. It all started with a darkened stage with a starkly black backdrop looming behind angular, symmetrical apparatus of mysterious function. Then, as the audience began to fill the venue, huge intensely colorful banners reminiscent of medieval battle standards slowly descended at the back of the stage, heralding the approach of musical royalty. Suddenly, there she was, marching across the stage with her entourage of minstrels — her horn section, all clad in brilliantly colored costumes, her drummer, keyboardist and sound and light wizards — in an energetic procession of electrical impact. The crowd greeted her with massive enthusiasm and amidst the cheers, there was no question that the festivities had begun. In a show bright with creative brilliance and talent, everything seemed to shine with a magical glow yet the renderings of certain songs seared the soul with the clarity of shared human experience. Björk beguiled the thousands in attendance for a brief two hours, with her story songs of primordial longing, love and devotion (Hyperballad and Pagan Poetry) ; alienation, anxiety and frustration (All is Full of Love and Army of Me) ; intimate human connection (Jóga) ; and human dignity (Declare Independence). Her tiny frame shook with the intensity of her giant voice as she leaned forward to the crowd as if beckoning all to gather round and hear the secrets of life she had to tell. Then she danced and pranced across the equipment crowded stage as if expecting everyone to follow right behind. While that was clearly physically impossible in the cramped confines of a space more appropriate to a conventional rock show than the sweeping epic of a Björk performance, she did succeed in getting the crowd to follow her vocally during her rendition of Jóga. And as the voice of the audience filled into the rafters, this sorceress of musical magic paused as if enthralled by the sheer joy and unity of this human sound, before joining in and carrying the melody on to its intended fruition. Throughout the show, the music thrummed and hummed in an extraordinary cascade of human experience and emotion, somehow magically conjured in a venue notorious as a sound engineer’s nightmare (due to it propensity for persistently uncontrollable echoes and thick reverb). Not a whisper or a shout unheard or out of place, the sound was impeccable, intertwining beautifully with Björk’s fairy-queen-like dances of exuberance and ecstasy, and the mind warping laser play that bathed the audience with an other-worldly glow. As Björk sang her lyrics of the mystery and banality of human existence, the laser inscribed words of indiscernible definition over the heads of the swaying crowd. In the end, the meaning of it all was clear enough ; art is a language that everyone understands. And Björk and her troupe — musicians, technicians and engineers alike — can all speak this language exceedingly well.